Is There Really a Wedge Between Production and Wages? Look at hourly pay, not annual household or family income. 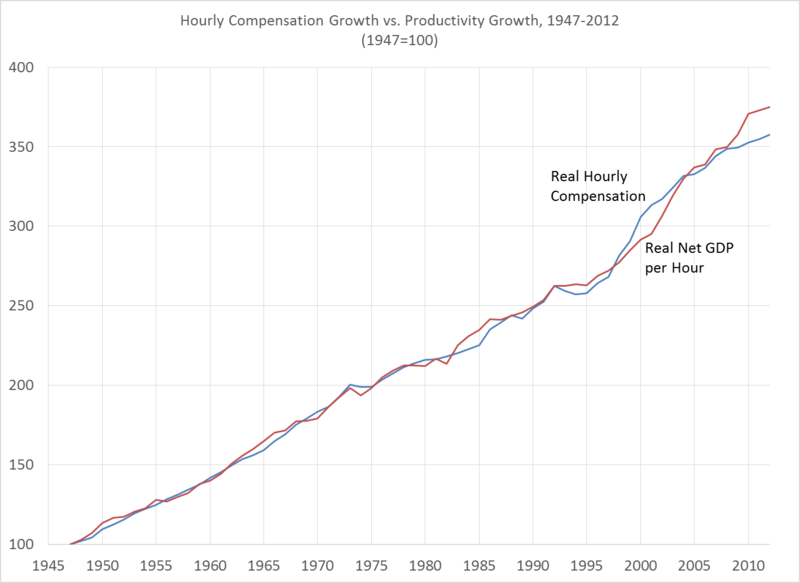 Look at hourly compensation, not hourly wages. Look at the mean, not the median. Compare the pay and productivity of the same group of workers. Use the same price adjustment for productivity and for compensation. Exclude forms of income that obscure the fundamental question of whether workers receive higher pay when they produce more value. [The chart above] compares the compensation of production and nonsupervisory workers in the private sector to productivity in the overall economy. The twenty percent of the workforce that falls outside “production and nonsupervisory workers” are excluded from the compensation trend—a group that includes supervisors, who are higher-paid than non-supervisors. Meanwhile, the productivity trend includes them. If productivity has increased primarily among supervisory workers, then we wouldn’t expect compensation among other workers to track productivity growth.